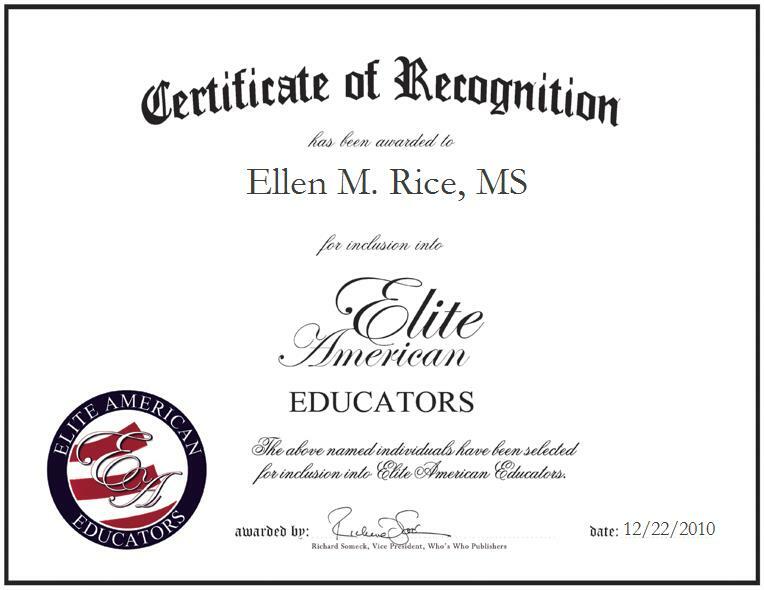 Nanuet, New York | December 22, 2010 | Ellen M. Rice, M.S., Leisure Arts Instructor at St. Dominic’s Home for the Disabled, has been recognized by Elite American Educators for demonstrating dedication, leadership, and excellence in art instruction. With nearly three decades of experience in artistic pursuits, Ms. Rice is responsible for teaching arts, gardening, computer usage, and leisure activities to seniors. As an Instructor at St. Dominic’s Home, Ms. Rice enjoys watching her students, who are in need of social, educational, and physical growth, mature and succeed. As a person with a disability, Ms. Rice is sensitive to her students’ struggles; she is dedicated to their success, and has a strong sense of loyalty towards others. In a profession that continually changes and evolves, Ms. Rice enjoys the chance to frequently learn new things and the opportunity to maintain growth in her career. For others in the educational field, Ms. Rice advises to stay focused and be passionate and compassionate towards others. A graduate of St. John’s University, Ms. Rice earned a master’s degree in Theology in 1982. Ms. Rice is extremely dedicated to helping others and she has dedicated some of her time outside of her career to volunteering with the Catholic Charismatic Renewal, the Social Action Committee and the Spiritual Life Committee.